Rediff.com » Movies » An entrepreneur who acts too! Rana Daggubati, grandson of producer and 'occasional' actor D Rama Naidu (who is a Guinness Book Record holder as far as film production is concerned), the son of Suresh Babu (producer and distributor) and the nephew of Telugu superstar Venkatesh first dabbled in visual special effects and production. He set up Spirit Media, a technological unit for visual special effects in Telugu, Tamil and Hindi films. 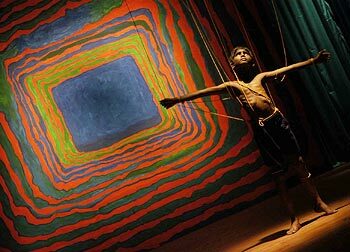 Rana also produced the National Award-winning film Bommalata -- A Bellyful of Dreams. This entrepreneur, who brought state-of-the-art technology in visual effects, is now turning actor with Leader, a film directed by Sekhar Kammula. The 20-something filmmaker talks about his journey to Radhika Rajamani. I was born in Chennai as my family was there (the Telugu film industry was based in Chennai for quite some time before it shifted to Hyderabad). From school, I used to go on the sets and the editing room to see how films were shot and edited. This was more fun. In fact I could also shoot with a real camera. I also did industrial photography from the Institute of Imaging Technology for a year. Then I graduated to cinematography and later went animation and special effects. I learnt all on my own. With four friends from the National Institute of Design, Ahmedabad, I set up a small shop called Spirit Media in 2003. We were a bunch of four friends doing cool things for films. We didn't think of ourselves as animators. We just found this new toy to play around with. I found that Hindi films had better special effects as compared to Telugu. I realised that it had to be done in Hyderabad and therefore to address that gap, Spirit was set up. Spirit got into visual effects space and telecine. Nippuna (of Satyam) joined us and within a year we expanded into a large facility. We had 55 per cent of the market share in Tamil and Telugu films and were also generating ideas for films. We worked on some projects like Sainikudu, Lakshmi and Dashavatharam to name a few. When I set up Spirit it was unique -- it was the first of its kind. But at the same time we were working harder and getting paid less. It started to become a less solid business. So Spirit merged with Prime Focus (which had serious volume too) and this helped. I'm on their board too. I used to assist in production -- handle all the technological aspects. So I have a broad overview though I was not associated with production on a day-to-day level. I produced Bommalata: A Bellyful of Dreams. I have known Prakash for long. Our grandfathers have known each other. Prakash is a good writer. He had this idea and wrote it. Making the movie was good fun. We used puppetry. Dadi Padamjee did a good job. It was an art of learning for us. It gave me credibility as a producer of sensible films. The film won the People's Choice Award at Los Angeles. We waited for the National Award which came after one year. (The film got two National awards -- The Best Telugu film and the Best Child Actor Award for Sai Kumar, the lead protagonist). My approach to acting itself was quite corporate. I undertook training in many areas like theatre (Barry John), dance, stunts (in USA) etc. for two years before taking up acting. We rehearsed before the film was shot. The corporate in me will never die. I was disciplined and had a calendar of activities drawn up for those two years about what to do. In fact I had one calendar for Mumbai and another for Hyderabad. Even my fitness was planned and executed. I was wondering about the kind of film I should do when Sekhar Kammula called and narrated the story of Leader. I jumped at the chance as these are stories we rarely get to hear. Sufi singer Abida Parveen, live in Chennai!